Rare Kailua land sale! Prime S. Kalaheo Ave location. 37k+ s.f. street-to-beach lot situated on one of the best stretches of Kailua beach. This could be the last opportunity to build your tropical dream home or develop your own private compound with up to 3 homes. If the sands could sing, you x2019;d hear the sweet melodies of Hawaiian music kanikapila-style as this property once hosted many of Hawaii x2019;s famous musicians. Pick your beach-front pleasure, windsurf, kiteboard, SUP, dive, paddle, or just relax on the sand and enjoy the warm turquoise waters of famed Kailua Beach -all in near proximity to laid-back Kailua Town, home of quaint shops, boutique stores, Whole Foods, Maui Brewing Co., Roy’s new restaurant, Goen, plus a Target. Truly the opportunity of a lifetime! Make it your’s today! Please, send me more information on this property: MLS# 201830589 – $6,900,000 – 126 S Kalaheo Avenue, Kailua, HI 96734. 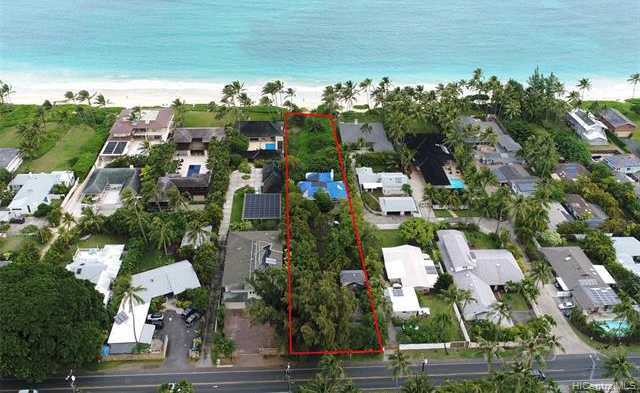 I would like to schedule a showing appointment for this property: MLS# 201830589 – $6,900,000 – 126 S Kalaheo Avenue, Kailua, HI 96734.